Diagnosing ovarian cysts poses a very unique problem. Due to the lack of symptoms, they are often left undiagnosed. Functional ovarian cysts appear and disappear on their won, and a woman may not be aware of it. Ovarian cysts are usually benign in nature. But in some cases, they can lead to serious complications. If someone ever discovers that she has ovarian cysts, she should be on alert and keep a close watch on them. Medical advice should be sought and if necessary, a course of treatment should also be initiated without delay. Owing to their usual lack of symptoms, as stated earlier, detecting their presence does not come naturally. In most cases, an ovarian cyst is accidentally discovered during a routine medical examination. In many other cases, it is discovered during an ultrasound test. Ultrasound remains one of the best imaging techniques for detecting ovarian cysts. The non-invasive nature of ultrasound testing makes it a popular choice among for various kinds of medical checks where a doctor needs to look into the internal organs of the body. Ultrasound uses sound waves to produce a real time image of the body's internal structures. What makes it even more popular is the fact that it is absolutely painless and very safe. Even though an ovarian cyst can be detected through other imaging methods (such as CAT scan or MRI or magnetic resonance imaging scan), most frequently it is ultrasound testing that does the trick. An ovarian cyst will appear as a lump or a bubble-like abnormality on the ovary in an ultrasound image. The ultrasound will also show what the ovarian cyst is really like. A cyst can be a simple sac of fluid (in which case, it is probably benign), or as a solid mass of tissue that requires more attention. Doctors rely greatly on ultrasound imaging in determining the level of risk and understanding the nature of the cyst. It is said, "A stitch in time saves nine". 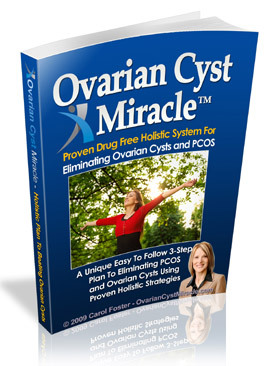 Ovarian cyst treatment is no exception to this golden rule. The sooner you can start the treatment process, the better. Timely intervention will prevent the condition from assuming more severe proportions and you can prevent it from developing further complications. If you start early, you can also eventually save yourself from having to undergo a surgery. And do remember that ovarian cyst surgeries may come with complications. So always consider this before opting for surgery. Being diagnosed with ovarian cyst is only half the battle. One has to start a process of treatment. It will not suffice to merely treat the symptoms or suppress the condition with harsh drugs or invasive surgical intervention. Unfortunately, this is the way conventional treatment works. What one needs is not just a temporary solution, but also a safeguard against possible outbreaks in the future. And this is what the holistic approach can guarantee. By addressing the problem at the grass root level, it removes the cause of ovarian cysts. In this way, it not only cures, but also minimizes the possibility of future occurrences of the same problem. It is amazing to realize that all this is achieved by very simple means that are close to nature, free from any side-effects and well within the easy reach of everybody.